Clan-Gifts.com - Scottish Clan Names - Clan Campbell Store! The name Campbell is said to be derived from two Gaelic words, "cam" meaning twisted and "beul" meaning mouth, these features traditionally belonging to Gillespie O Duithne who lived early in the 13th century. Some historians suggest that the most likely origin of the family is Flemish, coming over with William the Conqueror in 1066. Ancestors of the Campbells used the Flemish name Erkinbald (Archibald in Scotland). Others say that the line goes back to the Britons of Strathclyde. A former name for the Campbells was "Clann O'Dhuine" and Duine's son was Diarmid and so the name "Clan Diarmid" is also used. There are a number of main branches of Campbell - Argyll, Breadalbane and Cawdor. The first Campbell in written records is Gillespie Campbell in 1263 although it would appear that the clan had been established in Argyll at an earlier date. Archibald Campbell obtained the Lordship of Lochow when he married the King's Treasurer and Sir Colin Campbell of Lochow, knighted in 1280, founded the Campbells of Argyll. Sir Colin was killed in a skirmish with the MacDonald Lords of the Isles and a cairn still marks the spot where he fell. From him, the title "MacCailean Mor" or "Son of Great Colin" has been carried by the clan chief to this day. Sir Neil Campbell supported Robert the Bruce and was rewarded with lands forfeited by the Macdougals. Sir Neil also married King Robert's sister and their son, John, was created Earl of Atholl. Another Colin Campbell was made Earl of Argyll in 1457 and his son, Archibald, who was Lord High Chancellor, was killed at Battle of Flodden in 1513. The fifth earl commanded Mary Queen of Scots' army at the Battle of Langside in 1568, while his brother supported the opposition. Archibald, the 10th Earl was a close supporter of William of Orange and was rewarded with the title of Duke of Argyll and Marquess of Lorne and Kintyre in 1703. The Campbells are still remembered for the massacre of 38 MacDonalds in Glencoe on 12 February 1692, in an act of treachery. The government troops who carried out the orders were led by a Captain Robert Campbell but the orders were signed by the Secretary of State, Sir John Dalrymple, Earl of Stair. Campbells were noted as staunch supporters of the government both in the early years when they opposed the MacDonald Lordship of the Isles and later opposed the Jacobite Uprisings. They were well rewarded for their loyalty - and also married shrewdly to extend their lands and power. By the 19th century they owned 40 estates covering almost 1.25 million acres, most of it owned by the Duke of Argyll. Castles with Campbell connections are Dunstaffnage near Oban, Cawdor near Inverness and Inverary in Argyll (the latter is the seat of the current clan chief). Campbell was the 8th most frequent surname at the General Register Office in 1995. The Campbell motto is "Ne obliviscaris" ("Do not forget). A number of other clans/families are septs (sub-branches) of the Campbells, including Burns/Burnes, Caddell, Hastings, Hawes/Haws/Hawson, Lorne, Loudon, MacConnechy, MacDermid/MacDiarmid, McIsaac, MacIver/MacIvor, MacKellar, MacKelvie, MacLehose, MacOwen, MacPhedran, MacTavish, MacUre, Pinkerton and Ure. 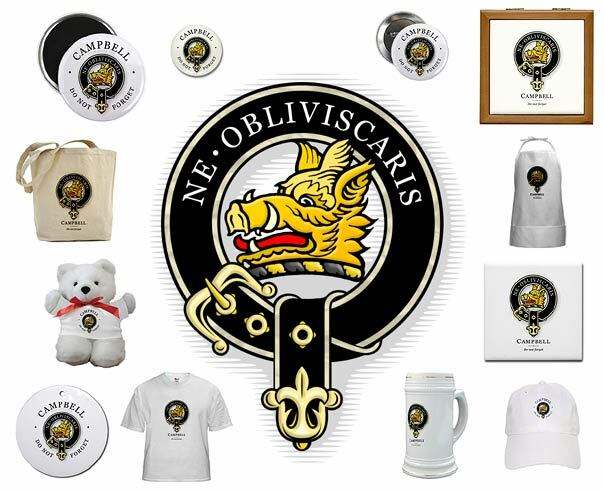 At Clan-Gifts.com we offer a wide range of quality Scottish gift Items, souvenirs, apparel and housewares, all printed with a beautiful rendition of your authentic Clan Campbell crest! Our Clan Campbell gift store stocks over 70 products*, and all items are fully guaranteed! Our great prices, low shipping costs and excellent customer support make us an excellent choice for Scottish Clan Campbell merchandise!